I wanted to share an easy project with you that has beautiful results. I took down my Christmas wreath and knew I wanted to put something in it's place. 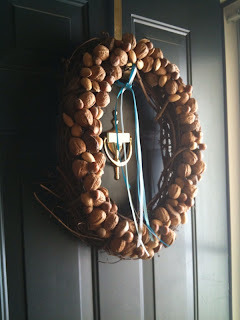 I'm not the traditional "green garland wreath" kind of gal, so I wanted something different. 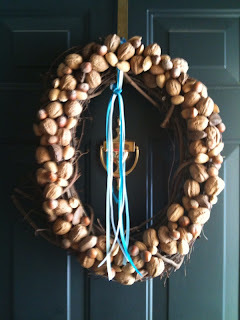 I made a Winter Walnut Wreath. First, start with 2 pounds of Walnuts. Then, you'll also need 2 pounds of mixed nuts. 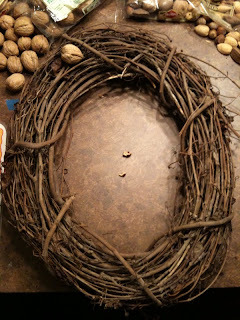 I used a handmade grapevine wreath so that if I had any open spaces, you wouldn't see wood or styrofoam underneath. It gave it a great natural look. Start with the walnuts. 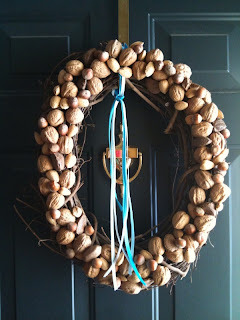 Make your way around the wreath using hot glue to attach the Walnuts facing different ways. 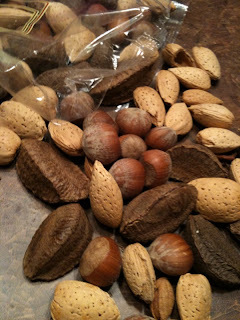 Then, go back around filling in all the spaces with the mixed nuts. I ended up using a lot of hot glue for this project, so make sure you have plenty on hand. I added a few skinny blue & white ribbons on it at the end to make it say "winter". However, you could add other colors for other seasons. OOOOh I have to make this! 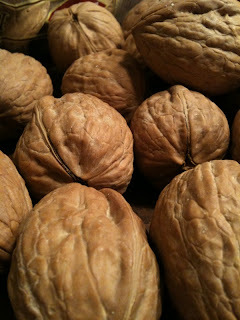 Hmm maybe i could spray paint the walnuts red and white for V-Day?